Hi All, its long time i wrote on SOA technologies so this week end decided to write on BPEL again. In this post i will start explaining on how to create BPEL process programmatically rather using GUI tool (Drag and Drop). First lets create BPEl project and process as explained below. 1. Create a new BPEL project named “BpelTest” by selecting File→New→Others→BPEL 2.0→BPEL Project. Select Next. Type the project name as “BpelTest”. Click Finish. 2. Create a new BPEL process file named “BpelTestProcess” by right clicking on the BpelTest/bpelContent folder, select New→Others→BPEL 2.0→New BPEL Process File. Click Next. 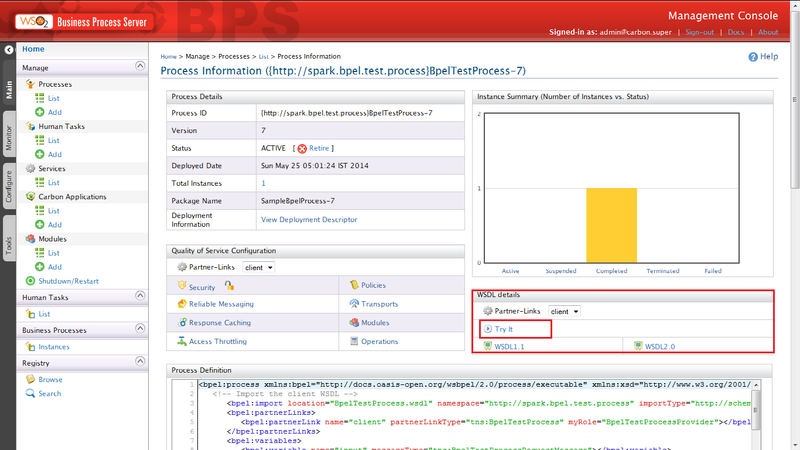 Fill in BPEL Process Name the string “BpelTestProcess”, and in the Namespace the string “http://spark.bpel.test.process&#8221;. 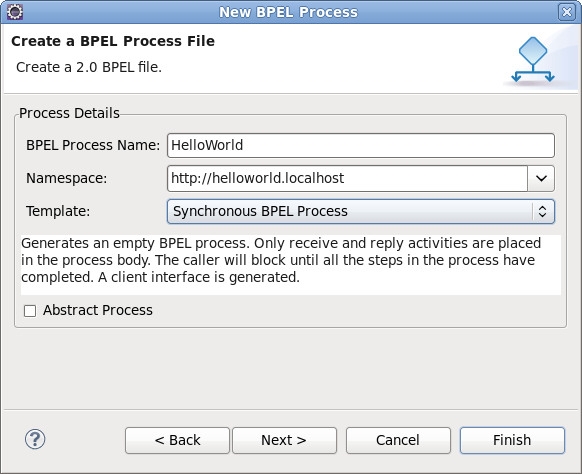 Select the Template as Synchronous BPEL Process. Click Finish. Note : Please rename the WSDL that is create as shown in the screen shot below. Once the BPEL process is created let us change it as show as below. 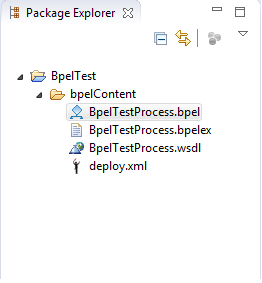 BPEL process file contain 5 major sections. 5. Orchestrating the Process Logic. 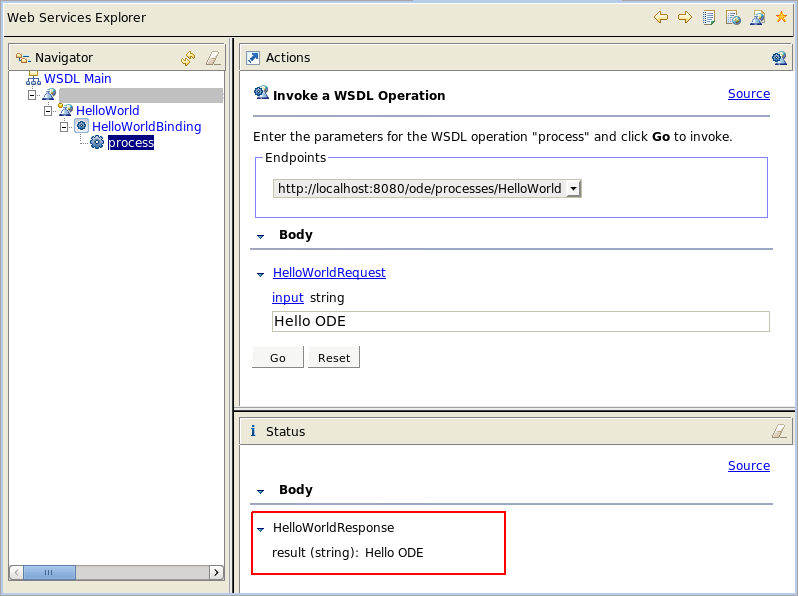 The Bpel Process name space and Client WSDL import are shown as below. Now its time to specify the partner links and declare variables as shown below. Here we come with the exact orchestration logic. combining the sequence of xmls, final resultant BPEL Process code is as below. also the deploy.xml looks as below. Download WSO2 BPS server(BPEL Process Server) from this link : http://wso2.com/products/business-process-server/. once the server is downloaded we start it by running the wso2server.bat file located in “YourDownloadLocation\$BPS_Home\bin”. Once the server is up and running we can open the management console by typing the below URL “https://localhost:9443/carbon/admin/login.jsp&#8221; and login with the admin/admin user and password. click on the process name this will take us to the process specific page and there we can find TryIt tool. please follow the screens as below. once we click on the try it. this will open a testing tool where we can send request and response will be shown. In my next write up we will see how to call Java Code from BPEL Process. 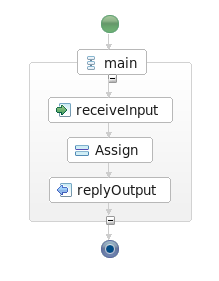 Objective: deploying a BPEL process which receives an input string from a client and responses it exactly that input. 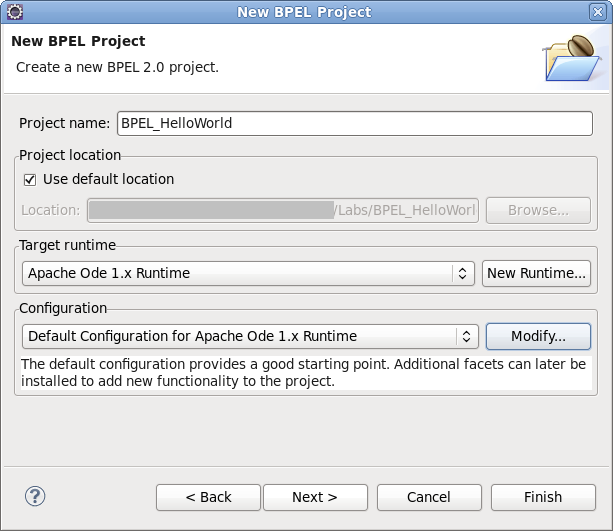 step1.Create new BPEL project: File→New→Others→BPEL 2.0→BPEL Project. 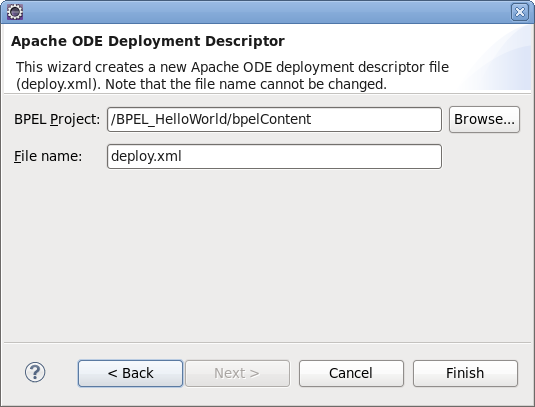 step2.Name it BPEL_HelloWorld. Select the Target Runtime as Apache ODE 1.x Runtime and Configuration as Defaut Configuration for Apache ODE 1.x Runtime. Click Finish. step3.In the folder BPEL_HelloWorld\bpelContent, File → New → Other → BPEL 2.0 → New BPEL process file. 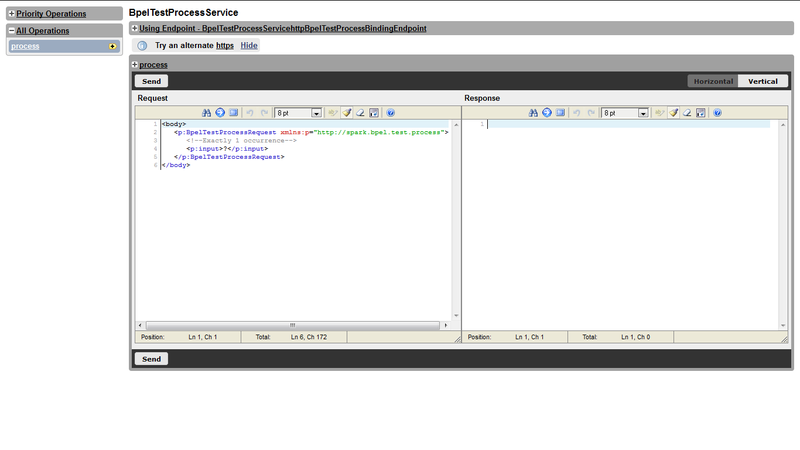 step4.Name it HelloWorld, Namespace http://helloworld.localhost and select Template Synchronous BPEL Process. Click Next. step5.Edit the Service Address to : http://localhost:8080/ode/processes/HelloWorld (suppose that your Tomcat environment runs at port 8080) and keep other default declarations. Click Finish. step6. 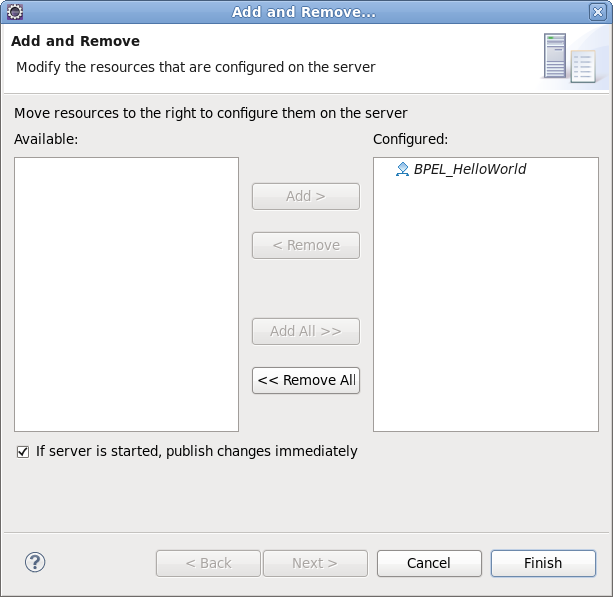 Three files are created in the folder bpelContent and the HelloWorld.bpel is opened for editing the BPEL process. step8. Drag the Assign action next to the receiveInput action and delete the FIX_ME-Add_Business_Logic_Here. step9. Right click on the Assign activity. Select Show in properties. step10.In the Properties tab, select Details. Click on the New button to define an assign operator. step11.Assign from input→payload→input to output→payload→result. An Initializer popup dialog appear. Click Yes to initialize the output variable and save the process. step12. It’s time now to deploy the BPEL project. Click on the folder bpelContent, select File→New→Others→BPEL 2.0→Apache ODE Deployment Descriptor. step13. Click Next. 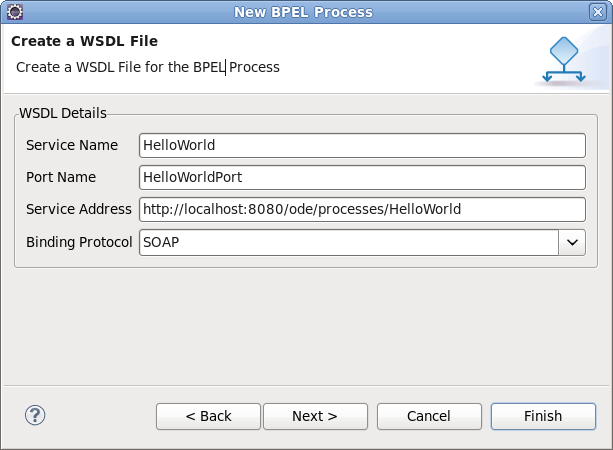 Verify the BPEL Project name as BPEL_HelloWorld. Click Finish. step14 .Double click on the deploy.xml file in the bpelContent folder. step15. 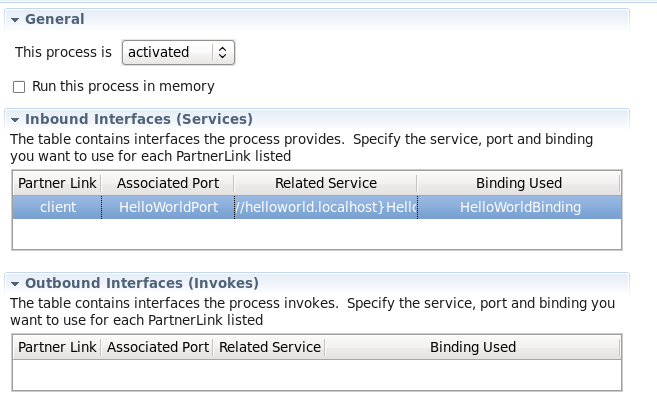 In the Inbound Interfaces table, select the Partner Link as client, Associate Port as HelloWorldPort. Click on Related Service then other fields will be automatically filled. Save the deploy.xml file. step16. To deploy the project on the server, right click on the Ode v1.x Server at localhost, select Add and Remove Projects. step18. Start the ODE server. If the deployment was successful, you will see the following output in the console tab. step19. We will test the project with Web Services Explorer provided by Eclipse. Right click on the HelloWorldArtifacts.wsdl file. Select Web Services→Test with Web Services Explorer. step20. Select the operation process. Then, type Hello ODE in the input textbox. If your deployment was success, you will get the same string in the SOAP response. 1.Suppose that you have already downloaded and installed your Eclipse > v3.6.2(Helios,or Indigo), version for Java EE Developers and JDK (version > 1.5). 2.Open the Eclipse, go to the menu Help→Install New SoftWare. 4.Now you have the update-site of BPEL available on the eclipse. 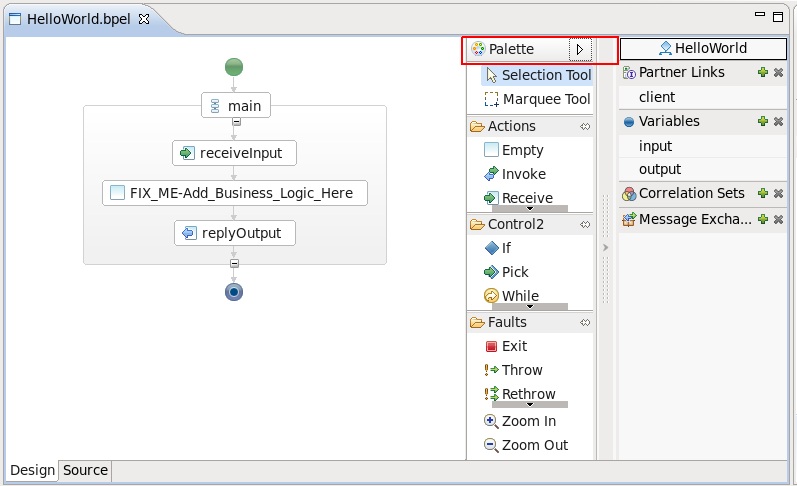 Select the check box to BPEL Visual Designer and click on the button Next. 5.Follow the installation windows, you will now have your BPEL installed on Eclipse. Note that: the BPEL dependencies(WTP, EMF, GEF, JEM) should be installed before the BPEL designer. Fortunately, with Eclipse Helios for JavaEE, you have all. 6.After finishing the installation, restart it. 7.To verify the installation was successful, after the restart, click on File→New→Other, you will see the BPEL 2.0 is on the list. The BPEL designer is now ready to use. However, to run the BPEL process, you should have the server’s environment. Now, we are going to install the Apache ODE for the BPEL deployment. 1.Download and extract the latest ODE from the Apache web site. The current stable version is the ODE 1.3.5. 2.Inside the “apache-ode-war-1.3.5” folder, you will see an “ode.war” file. Deploy this file on your Tomcat server. 3.The simple way to do this is extracting the “ode.war” file to get the ode folder. 4.Copy this ode folder to your TOMCAT_DIR/webapps directory. 1.Show the “Servers” view by selecting the menu Windows→Show View→Servers. 2.Right click on the empty space of the “Servers” view, select New→Server. 3.Leave the server host name as localhost and select the server type as the Apache→Ode v1.x Server. Rename the server’s name if you want. In my installation, I keep the default name. Then click on the button Next. 4. Show the “Servers” view by selecting the menu Windows→Show View→Servers. Right click on the empty space of the “Servers” view, select New→Server. Leave the server host name as localhost and select the server type as the Apache→Ode v1.x Server. Rename the server’s name if you want. In my installation, I keep the default name. Then click on the button Next. Note that: the ODE Runtime configuration above can also be added or editted using the menu Windows→Preferences→Server→Runtime Environments. 5. Click Finish. You now have the ODE server which is ready to run on the Eclipse. You can see this server on the Server View. 6.Now, you should test the server’s configuration by right click on the ODE server entry and select Start. Or you can click on the Start button on the Server View. If the server is sucessfully started, you will see the status like this. Could not find the main class: org.apache.catalina.startup.Bootstrap. Program will exit. 7. This error occurs maybe because it misses the tomcat-juli.jar in the Launch environment. 8. To fix this, double click on the installed Ode v1.x Server in the Server View to see the configuration. 10. Now try to start your ODE server in the Server View.